Branded flash drives are omnipresent in our educational system. We review the best choices for colleges and K-12 classrooms. There are few items that unite student and teacher in approval like promotional USB flash drives do. In the education environment – no matter which side of the teacher’s desk you sit – USB flash drives have become a very useful gadget. They can make the task of trying to get through the school day with your sanity intact an easier one. Students have long told stories of the dog that ate their homework. It’s a fact that assignments and essays sometimes disappear at very inconvenient times. USB flash drives mean that students can keep all their work in one place – reducing the likelihood that they’ll lose stuff – and not have to carry so many notebooks and textbooks around. They can also access teacher notes, assignments in progress and any other course information at any time – anywhere they have access to a computer. For students with a lot on their mind, USB drives serve as a hub around which to base their studies and keep a track of all their work. For teachers, the drives serve as a way to communicate efficiently and effectively with a class. Teachers can easily access material or a submitted assignment. And, they can load a student’s drive with something they’ve misplaced or with extra information to guide them through a task. 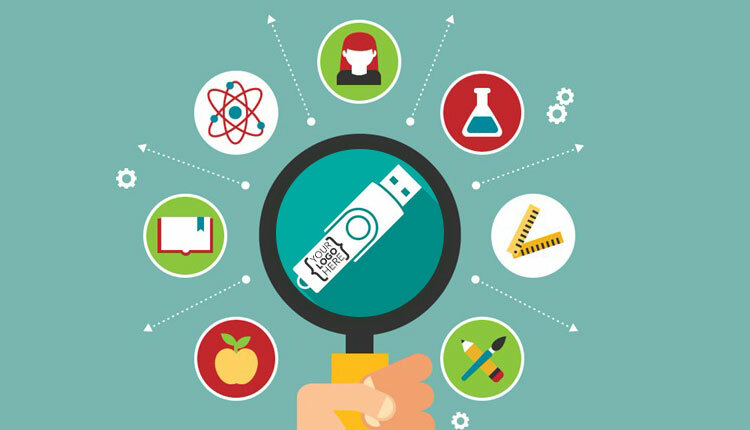 As well as offering great advantages in the classroom, student flash drives offer a way to run electronic courses mainly offline. That is a big deal for students that don’t have easy or reliable access to an internet connection. Be that for geographical or for social reasons. Schools and colleges all over are turning to USB flash drives to deliver revolutionary new methods of education. Promotional USB flash drives don’t just represent a good way to organize work. They use a solid-state chip to store data. So, they’re not prone to being magnetically corrupted while being moved around – like disc drives are. They are also shock proof, and that is great news in the rumble-tumble world of high school. Flash drives also save students money. “For less than $10, your teen could buy a flash drive instead [of a printer], save his 20-page term paper on it, and print the paper in the campus computer lab, which you are likely already paying for,” writes Kiplinger. USB drives can take a lot more physical abuse than more fragile forms of data storage. USB drives are portable, practical, and custom etched with details of different courses, students, teachers or educational establishments. As such, they are a smart choice for both students and teachers. For colleges and universities that seek to recruit the best talent, USB drives can be loaded with promotional and informational material. Open to all forms of media, a professionally presented USB drive can even be loaded with virtual tours of campus locations like classrooms and libraries. You can use a drive to deliver course information and even presentations by tutors, complete with their full academic credentials. Promotional USB drives offer a new way to present your educational establishment at its best to potential students and even employees from out of town. Additionally, when it comes to a new intake, they’re a valuable and paper-free option for orientation purposes. Schools and colleges can go fully digital with welcome packs, maps and multi-media open-day information. For educational establishments that want to present a paperless, eco-friendly image, USB drives are ideal. Promotional USB flash drives are extremely affordable too. And they’re not only practical in terms of cost. They make the whole education process a lot easier. And the good news is that we have some designs that are extremely hard to misplace. Which is even greater news for end-of-year grades. Let’s take a look at our top five USB drives for teachers and students. Students can forget forgetting their homework. The wristband USB flash drive is here to save the day. This is a very practical piece of kit for any student. Always on hand – literally – it’s a must for students who are prone to be a bit absent-minded when it comes to handing in assignments. With full branding options, the wristband USB drive is available in a range of colors too. You can even write further notes on the band with a marker pen – if you want to add names or information about contents. Durable, reliable, and a very visible option – this drive will basically form part of the student uniform when it’s printed with a school or college crest. These flash drives can be anything that you want them to be. We’ll develop any shape to suit your requirements. Great for promoting individual college departments to the outside world, or for awards to give to students for participation in school competitions or events – custom shaped USB drives offer many possibilities. Combining the practicality of a standard USB drive with the novelty of just about any object you’d like to create, these drives are great fun. They can also be a very visual way to represent storage for different subject matters, sports or even locations throughout the school. If you can think of it – we can make it. Turnaround time is just 15 – 20 days, and the minimum order is only 100 units. The design-and-manufacture process is quicker and easier than you’d think. One of the stars of the whole data storage show and guaranteed to get you some street cred is the business card USB drive. Whether you’re handing them out to students or you’re receiving one – these flash drives are a stylish and very practical item. They fit as easily in your wallet as a credit card and are available in a wide range of designs and colors. Teachers and tutors can use them to make sure that their contact details are always readily available to students. You can even use the large printable area to denote what data is contained within the drive, or to specify assignments or classes. Alternatively, the printing area on the business card USB drive can be used for a student’s name, course and college details. It’s a great drive, and perfect for school or college use. This is a very versatile drive and it carries the advantage of being able to fit devices with both the new type-C USB connection, and the older USB type sockets. It’s a great drive for an environment like a school or college, where some students will have devices that are more up-to-date than others may have. This USB drive is extremely durable and able to withstand a lot of abuse because it’s constructed from metal. Information or a crest or logo can be etched onto the body of the device. This flash drive also attaches very easily to a keychain so it’s hard to shake it off. Future-proof, universal, and great to look at – the C-Spin USB drive is definitely one to consider for your college or school. This is a great option for schools and colleges that use ID Cards or access cards. The Lanyard incorporates a USB drive within a handy catch and is also easily attached to bags or items of clothing via its clip. The strap provides a large area on which to print information or names, school crests or contents information. The lanyard presents a very useful format for a storage drive which is perfect for school or college use. The Lanyard USB Flash drive can either be screen printed or laser engraved and it comes in a wide range of colors that will suit any application or school uniform. Flash drives for teachers offer a lot by the way of making their own job easier. And they offer great promise for making it easier for students too. USB drives serve as a very portable option for data storage and transport – for student assignments and everyday requirements to turn work in on time. They can also be easily loaded with information that serves to help students to learn. The advantages for a teacher wise enough to hand out student flash drives are almost too many to mention. And the options for personalizing drives mean that they can be used to keep work organized and up to date – for different classes and subjects. Students who use shared computers at school can even use USB drives to upload their own program preferences instantly. USB drives can be used to unlock cloud data storage. And they can hold a staggering amount of educational media, in all forms. Teachers can easily supply their students with helpful information in the form of written instructions, links to websites, and even videos and pictures. It’s never been easier to educate electronically, and USB flash drives are perfect in today’s multi-media teaching environment – for both students and teachers. We have many types and styles of custom USB flash drives for teachers and for students available. Why not have some promotional drives molded and shaped to your own design? USB drives will enhance the learning or teaching experience for any student or teacher. They’re truly top of the class as a great way to promote your school or college. If you have any questions or you’d like to know more, give our friendly team a call and be sure to browse our range of fully customizable USB drives. Are USB Business Cards Worth the Investment?